Like many Americans, Kory Levoy's weekly routine included shelling out $50 to $60 a week to fill his Audi TT Roadster. In the six months he has owned his Chevrolet Volt, Levoy has driven approximately 7,500 miles and has filled up only three times. "I was tired of spending roughly $200 plus a month on gas," said Levoy, a manufacturing manager from Yorba Linda, Calif. "The ability to not even consider finding a gas station or worry about fuel pricing is a phenomenal experience." Like many other Volt owners, Levoy is averaging 40 miles on a single charge of electricity, more range than he needs for his daily commute of 25 miles each way to work. "At night I charge my Volt at home using my 240-volt home charging station, and am then able to use my 120-volt portable vehicle charge cord to charge during work, meaning I rarely need to use gas," said Levoy. Levoy estimates his average electric bill to charge his Volt is about $25 a month, or less than a dollar a day. Even with paying for more electricity, Levoy could save close to $2,000 a year in gasoline. Levoy is not alone in seeing real savings from owning a Volt. Carey Bailey, an electrical engineer from Cottage Grove, Ore., used to spend about $500 a month in gasoline for his 75-mile roundtrip commute. Since purchasing his Volt in January, Bailey he has cut that to about $100 a month and expects it to drop further. He estimates it costs roughly $1.10 a day to charge his Volt. "Each day, I use about a quarter of a gallon of gas to get to work, which is hardly anything," said Bailey. "Being able to charge at work is an added benefit and I love the fact that I am reducing my carbon footprint by not consuming as much gas." 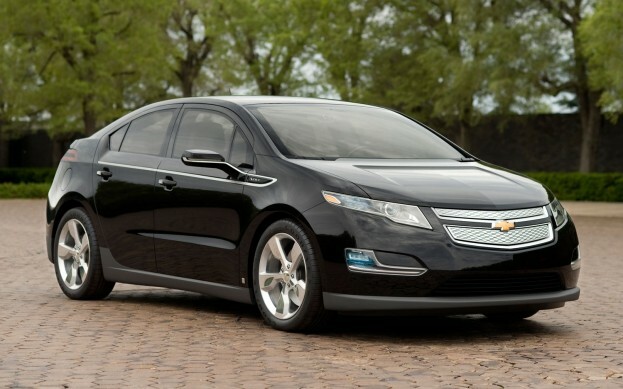 The Volt's extended-range capability offers a total driving range of up to 379 miles, based on EPA estimates. For the first 35 miles, the Volt can drive gas- and tailpipe emissions-free using a full charge of electricity stored in its 16-kWh lithium-ion battery. When the Volt's battery runs low, a gas-powered engine/generator seamlessly operates to extend the driving range another 344 miles on a full tank. "About two-thirds of the more than 2 million miles driven by Volt owners to date have been powered by domestically produced electricity," said Cristi Landy, Volt marketing director. "We are hearing from owners like Kory and Carey who are able to charge both at home overnight and at work during the day. These owners are able to maximize driving on electricity alone, seeing real saving at the pump and in their wallets."